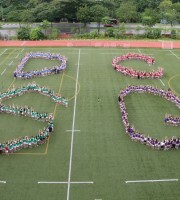 Welcome to the Junior School at Dulwich College (Singapore). 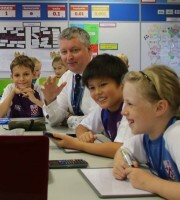 We are an international school with independent school values. In all that we offer inside and outside the classroom, we build honesty, integrity, respect, tolerance and leadership - characteristics that define the students of Dulwich College (Singapore). Academic learning is at the heart of what we do and is aligned with the expectations of top independent schools in the UK. Enriched to reflect our school personality and local and global contexts, the enhanced curriculum develops international mindedness. Our highly qualified and passionate staff seek to challenge every individual, providing opportunities to discover new talents while nurturing existing interests. Learning engages our students, promotes independence and develops reflection and resilience. Our teachers know every student so well that they can capture their imagination in every lesson of every day. The students are challenged, connections are made. It is those sparks of new learning that our children will remember for years to come. Daily Mandarin lessons build upon the excellent foundations of the dual language approach in DUCKS and prepare our students for success in academic qualifications. The programme reflects the importance of Mandarin as a regional and local language. Our three language pathways ensure that native speakers of Mandarin and beginners are challenged appropriately. Integral to the Junior School curriculum is student's understanding of both the culture that surrounds the language and the traditions that underpin it, gained through opportunities such as art, music, drama, dance, stories and celebrations of major festivals. We've been learning how to write a formal letter in Chinese. Being part of the Dulwich family means that all students are known and cared for. Our strong and effective pastoral support is central to the self-efficacy of our learners and enables student well-being, safety and effective learning. We believe that our House system is essential in developing and inspiring a sense of belonging, responsibility and contribution to College life. Our House Captains, Student Counsellors, Community Action Groups and Ambassadors lead, inspire, and listen to their peers, enabling all students to actively contribute to school improvement projects. My responsibility as a House Captain is to make sure that everyone feels like they are doing something for the House when they participate. Motivating people and cheering them on helps them to feel good about themselves.